As war threatened in the Balkans, the attention of much of the French people focuses instead on the sensational case of Madame Henriette Caillaux, whose trial for the murder of Gaston Calmette, editor of the newspaper Le Figaro, opens on July 20, 1914, in Paris. Joseph Caillaux, a left-wing politician, had been appointed prime minister of France in 1911. He was forced out of office the following year, however, after he was accused of being too accommodating to Germany. Chosen again as a cabinet minister in 1913, the relatively pacifist Caillaux was under almost constant attack from the right. In his personal life, Caillaux was relatively indiscreet, parading his mistresses around during his life as a bachelor and carrying on a secret love affair with one of them, his future second wife, while he was still married to his first wife. Although Caillaux was an old friend of Raymond Poincare, elected president of France in March 1913, he and Poincare had become political adversaries even before World War I began the following summer. Shortly after his election, Poincare supported legislation that would increase the required length of military duty in France from two to three years, a measure that seemed necessary to many as a way of offsetting Germany's enormous population advantage–70 million to 40 million–in the case of a war. Despite opposition from Caillaux and other liberals, including the country's Socialist leader, Jean Jaures, the bill passed in August 1913. When Caillaux continued to attack it, he became the object of a major smear campaign led by Gaston Calmette, the most powerful journalist in France and the editor of the leading right-wing journal Le Figaro. Beginning in December 1913, Calmette claimed he could and would publicize certain documents that would prove Caillaux, while serving as minister of finance in 1911, had obstructed justice in a financial scandal in which he may have been personally involved. Moreover, Calmette threatened to publish love letters exchanged between Caillaux and his second wife, Henriette, while he was still married to his first wife. When Calmette threatened to publish intercepted wire communications supposedly showing Caillaux's sympathy to Germany--a claim that spurred a protest by the German government against the interception of its official correspondence--Caillaux went to Poincare and asked him to prevent Calmette from revealing the documents. If Poincare declined to do so, Caillaux pointed out, he himself would make public intercepted cables in his possession that revealed the French president's secret negotiations with the Vatican, a revelation that would certainly anger Poincare's secular and anticlerical supporters. The French government subsequently issued an official denial of the existence of the German cables, but Calmette continued to threaten to publish Caillaux's love letters. On March 16, 1914, Henriette Caillaux took a taxi to the offices of Le Figaro in the rue Drouot. After waiting for an hour to see the chief editor, she walked with him into his private office and fired six shots at him from her automatic pistol. Struck by four of the bullets, Calmette died that evening. 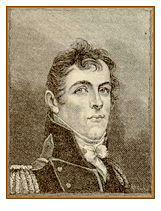 For most of its early history, the United States relied on volunteers to fight its wars. The first national draft, or conscription, occurred during the Civil War. Relative to the North, the Confederacy had a small population, and it needed a draft to ensure that it had enough soldiers. The Union followed with its own draft in 1863. Not all the potential northern soldiers, however, willingly embraced the draft. The Union's 1863 Conscription Act let wealthier Americans hire other people to fulfill their military obligations. This provision stirred anger among the poor, who felt that the burden of war was falling on their shoulders. Riots broke out in cities across the North, including a particularly bloody one in New York. 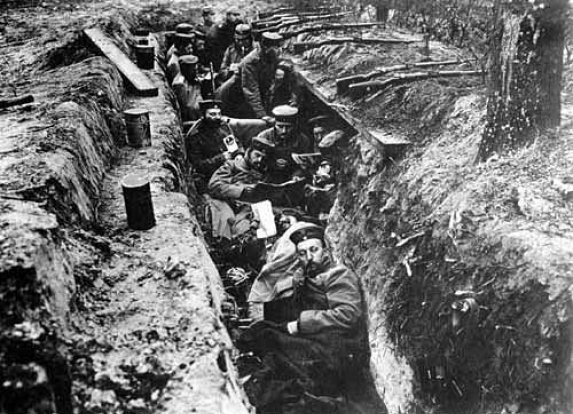 The Conscription Act, however, was never tested in the Supreme Court, so the legality of a national draft was left unchallenged until World War I, when Congress instituted another draft. The Selective Service Act of 1917 did not allow substitutes, as the 1863 law had, and it did allow for conscientious objector status: men who opposed war for religious reasons could avoid combat. Still, many people opposed the draft law. Although almost 24 million men did register for the draft, another two to three million did not. Hundreds of thousands more did register, but then failed to report when drafted or deserted soon after. The U.S. government arrested many of these men who tried to avoid military service, and some of them challenged the draft law. The State of the Serbs, Croats, and Slovenes, who are also known by the name of Southern Slays or Yugoslavs, will be a free and independent kingdom, with an indivisible territory and unity of power. This State will be a constitutional, democratic, and Parliamentary monarchy, with the Karageorgevich dynasty, which has always shared the ideals and feelings of the nation in placing above everything else the national liberty and will at its head. Russian Revolution: Prince Lvov resigns and Kerensky becomes Prime Minister and head of the provisional government. 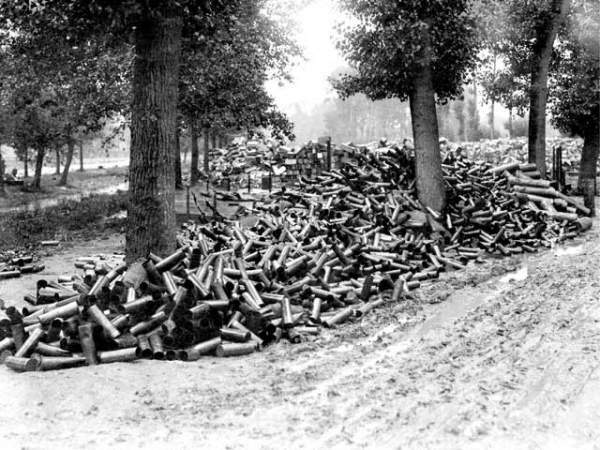 1918 World War I: List Regiment: Gefreiter Adolf Hitler's 16th RIR is relieved, but forced to withdraw under heavy harassing fire They will spend the rest of July helping to build a new line of defenses on the site of the failed Second Battle of the Marne. 1930 Poland: A census shows 3,113,900 Jews in Poland (9.8% of the population). Almost 80% of Jews declare Yiddish to be their mother tongue. Per capita income for Jews is 830 zloty and 585 for non-Jews. Jews account for 40% of Poland's university graduates. During the second half of the 1920s, when foreign loans fed German prosperity, parliamentary politics functioned better, yet many of the established elites remained hostile to it. With the onset of the Great Depression, parliamentary politics became impossible, and the government ruled by decree. Economic crisis favored extremist politicians, and Adolf Hitler's National Socialist German Workers' Party became the strongest party after the summer elections of 1932. In January 1933, the republic's elected president, Paul von Hindenburg, the World War I army commander, named a government headed by Hitler. 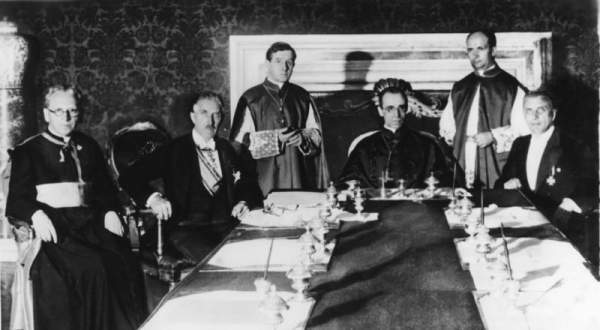 Church and Reich: Concordat: Franz von Papen, on the behalf of Hitler's Reich, and Eugenio Mar�a Giuseppe Giovanni Pacelli, the future Pope Pius XII, formally sign the Concordat in an elaborate ceremony at the Vatican. Reich Minister of the Interior Frick announces that now the entire German government is now under the control of Adolf Hitler and that the Hitler salute is henceforth to be generally used as the German greeting. A number of contemporary historians consider this the day Hitler's dictatorship of Germany actually begins. United Kingdom: More than 30,000 men, women and children jam the streets of London protesting Nazi persecution of German Jews, as the Academic Assistance Council is organized to aid expelled German Jewish scholars. After the SS gained its independence from the SA in July 1934, in the wake of the Roehm purge, Hitler authorized the Reich SS leader, Heinrich Himmler, to centralize the administration of the concentration camps and formalize them into a system. 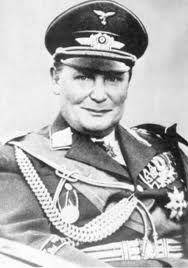 Himmler chose SS Lieutenant General Theodor Eicke for this task. Eicke had been the commandant of the SS concentration camp at Dachau since June 1933. 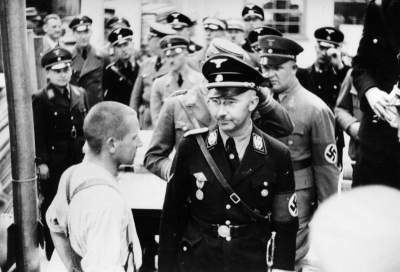 Himmler appointed him Inspector of Concentration Camps, a new section of the SS subordinate to the SS Main Office. Beginning with a call to boycott Jewish shops and businesses in 1933, measure after measure is introduced to expel Jews from the civil service, the professions and from one economic sector after another. Gradually, German Jews are pushed to the margins of society. With the Nuremberg Laws in 1935, they lose legal equality, and full citizenship. At the same time, the regime introduces ever new regulations to strip Jews of their property before they are forced abroad. More and more countries close their gates to German Jewish refugees. 1938 Holocaust: Members of the Wehrmacht are forbidden to live in Jewish-owned homes or apartments. 1940 World War II: Reichsmarschall Hermann Goering, C-in-C of the Luftwaffe, orders the formation of a Nachtjagdgeschwader (night fighter wing), NJG 1, under Oberst (Colonel) Kammhuber, consisting of Me-110 fighter bombers. Stalin:Old Russia was continually beaten because of backwardness. It was beaten by the Mongol khans. It was beaten by Turkish beys. It was beaten by Swedish feudal landlords . . . . It was beaten because of military backwardness, cultural backwardness, industrial backwardness, agricultural backwardness . . . . That is why we cannot be backward any more. Italy: The RAF launches a raid on Naples. The Jews are masters at fitting in to their surroundings, without in any way changing their nature. They are mimics. They have a natural instinct that senses danger, and their drive for self-preservation usually gives them the proper ways and means to escape danger at no risk to their lives or any need for courage. It is difficult to detect their sly and slippery ways. One has to be an experienced student of the Jews to recognize what is happening. Their response when they have been uncovered is simple and primitive. It displays a perfidious shamelessness that is successful because one usually does not think it possible to be so shameless. Schopenhauer once said that the Jew is the master of the lie. He is such an expert on twisting the truth that he can tell his innocent opponent the exact opposite of the truth even on the plainest matter in the world. He does this with such astonishing impudence that the listener becomes uncertain, at which point the Jew has usually won. Church and Reich: Bishop August von Galen of Munster, known as a courageous critic of the Nazis, expresses his hope for a German victory in Russia. August von Galen was born in Germany in 1878. He joined the church and eventually became Bishop of Munster. 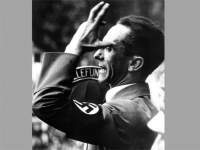 He held conventional religious views and was initially a supporter of Adolf Hitler and in 1936 blessed the troops before they marched into the Rhineland. Galen disliked the Nazis' racial doctrines and on one occasion wrote a critical review of a book by Alfred Rosenberg. In 1941 Galen spoke out in a sermon against the Nazi practice of euthanasia (the killing of those considered by the Nazis as genetically unsuitable). Adolf Hitler wanted Galen arrested but Joseph Goebbels warned against this as Galen was a popular religious leader. It is claimed that Galen's sermon inspired the formation of the anti-Nazi White Rose group. USA: Women's Army Auxiliary Corps (WACS): The first detachment begin basic training, at Fort Des Moines, Iowa. USA: The Legion of Merit Medal is authorized by US Congress. At the Gestapo at 7:30 in the morning. I asked Mende how much truth there was in the rumors. He answered that he had heard nothing about it. After this I asked Brandt; he answered that he knew nothing of the kind. To the question whether a thing like that could nevertheless happen, he answered that he knew nothing. I came away unsure. I went to his superior officer, Commissar Boehm. He said that it was not his department, that perhaps Hoheman might be able to make some statement in connection with the rumors. I observed that according to the rumors the deportation was due to start at 19:30 today. He answered that he would certainly know something if it were so. Operation Brimstone: An Allied invasion of Sardinia is cancelled, in favor of alternate landings in the area south of Naples (Anzio). Discussion with Dieter on Hitler's foreign policy before and after the outbreak of the war. I worked out the following ideas: the "inner" basis of the whole evil is a hybris-like immoderation coupled with a complete ignorance of the world. The malignant core was formed by the policy which, in forming a military bloc with Italy and Japan, brought about the division of the world into two camps - with the balance of power weighted against Germany. The decisive turning point to the explosion of war was the occupation of Prague. All the previous actions, especially the "Anschluss" and the incorporation of the Sudetenland, would have been tolerated by the world. "Munich" meant that these events were "swallowed", but with the firm resolve not to leave further German aggression unanswered. There is absolutely no reason to believe Hitler's assertion that after Munich England was resolved to attack Germany as soon as she was strong enough. The English resolve was rather to put themselves in a position militarily to resist any further aggression on the part of Hitler, having learned their lesson from the events up till then, and putting no trust in his assurances. Even then, it is highly probable that with a skillful German policy, England would not have prevented an opportune removal of the Corridor. So these men launched the war against Poland, in their criminal wantonness running the risk of the Western Powers' intervention, in complete failure to recognize the ratio of power, and, worst of all, with not the least idea of the significance of the sea as a factor. They thought the necessary security had been guaranteed by the pact with Russia, although they themselves had made this step with the thought in the back of their minds that came to light in 1941. There is no basis for the argument that Russia was about to attack or would have attacked. This is one of the most evil examples of preventive war which Bismarck condemned. If Germany "stumbled" into the two-front war in 1914, Hitler wantonly leaped into it in 1941. Russia had only one feeling towards an intact Germany, that of fear. It is out of the question that Russia would have attacked Germany as long as Germany possessed an unbroken army. 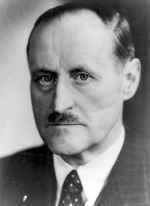 High German officials had made up their minds that Hitler must die. He was leading Germany in a suicidal war on two fronts, and assassination was the only way to stop him. A coup d'etat would follow, and a new government in Berlin would save Germany from complete destruction at the hands of the Allies. That was the plan. This was the reality: Colonel Claus von Stauffenberg, chief of the army reserve, had been given the task of planting a bomb during a conference that was to be held at Berchtesgaden, but was later moved to Hitler's "Wolf's Lair, a command post at Rastenburg, Prussia. 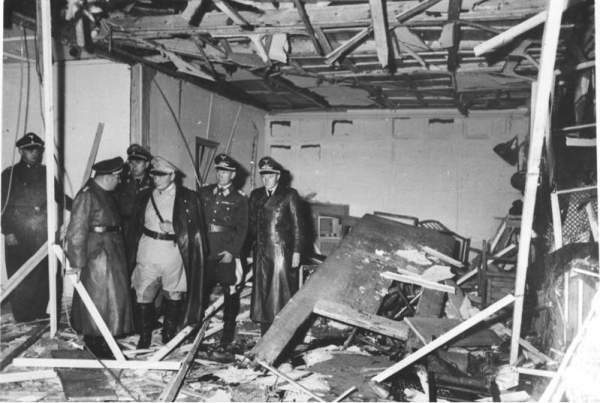 Stauffenberg planted the explosive in a briefcase, which he placed under a table, then left quickly. Hitler was studying a map of the Eastern front as Colonel Heinz Brandt, trying to get a better look at the map, moved the briefcase out of place, farther away from where the Fuhrer was standing. At 12:42 p.m. the bomb went off. When the smoke cleared, Hitler was wounded, charred, and even suffered the temporary paralysis of one arm-but he was very much alive. (He was even well enough to keep an appointment with Benito Mussolini that very afternoon. He gave Il Duce a tour of the bomb site.) Four others present died from their wounds. 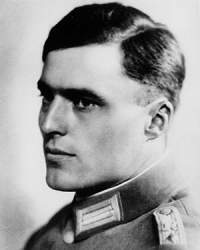 As the bomb went off, Stauffenberg was making his way to Berlin to carry out Operation Valkyrie, the overthrow of the central government. In Berlin, he and co-conspirator General Olbricht arrested the commander of the reserve army, General Fromm, and began issuing orders for the commandeering of various government buildings. And then the news came through from Herman Goering: Hitler was alive. Fromm, released from custody under the assumption he would nevertheless join the effort to throw Hitler out of office, turned on the conspirators. Stauffenberg and Olbricht were shot that same day. Once Hitler figured out the extent of the conspiracy (it reached all the way to occupied France), he began the systematic liquidation of his enemies. More than 7,000 Germans would be arrested (including evangelical pastor Dietrich Bonhoeffer), and up to 5,000 would wind up dead-either executed or as suicides. Hitler, Himmler, and Goering took an even firmer grip on Germany and its war machine! Remer was born on August 18, 1912, volunteered for service in the German army in 1930, and served as a front-line officer in France, the Balkans and on the eastern front. After promotion to Major and then Colonel, in 1944 he was chosen to command the Grossdeutschland guard regiment in Berlin. In this post, the 31-year-old officer played a historically pivotal role in putting down the attempt by a small circle of insurgent officers to kill Hitler and seize control of the government. On the afternoon of July 20, 1944, General Paul von Hase, the military commander in Berlin and a leader in the anti-Hitler conspiracy, announced to Remer, who was never a member of the Nazi Party, that Hitler was dead, that civil disorder had broken out, and that the army was assuming overall authority in Germany. Hase ordered Remer immediately to seal off key government buildings in central Berlin. 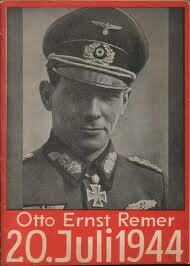 Hesitating to carry out this highly unusual order, Remer decided to contact Joseph Goebbels to confirm its validity. After telling the skeptical and uncertain Remer that Hitler was not dead, the propaganda minister and Berlin Gauleiter arranged for him to speak directly with the Fuehrer by telephone at his military headquarters in East Prussia. USA: President Franklin 'Horse In The Middle Of The Stream' Roosevelt is nominated for an unprecedented fourth term of office at the Democratic National Convention in Chicago; a convention FDR doesn't even bother to attend. Eastern front July 20-29: Joint AK/Red Army operations inflict 1,400 German deaths. 1945 USA: Two thousand people attend a rally at Olympic Auditorium in Los Angeles to protest Gerald L.K. Smith's racist and anti-Semitic activities in Southern California. 1948 Cold War:Truman issues peacetime draft with a proclamation calling for nearly 10 million men to register for military service within the next two months. Truman's action came during increasing Cold War tensions with the Soviet Union. 1958 WUnderwaffen: The first segment of a three-part biography of Werner von Braun, Hitler's former chief rocket scientist who is now working for the US, is published in The American Weekly, a magazine inserted into the folds of Sunday newspapers nationally: Space Man—the Story of My Life by Wernher von Braun as told to Curtis Mitchell. 1969 Neil Armstrong and Buzz Aldrin of Apollo 11 land on the Earth's moon, while astronaut Michael Collins orbits above. This and five subsequent Apollo missions will land, all told, 12 astronauts on the Moon, the last one in December 1972. This is a triumph of scientific exploration and, arguably, the greatest technological achievement in human history. See: Man on the Moon, the complete illlustrated story of Apollo 11. For me the most exciting event in the first year of my presidency came in July 1969 when an American became the first man to walk on the moon. 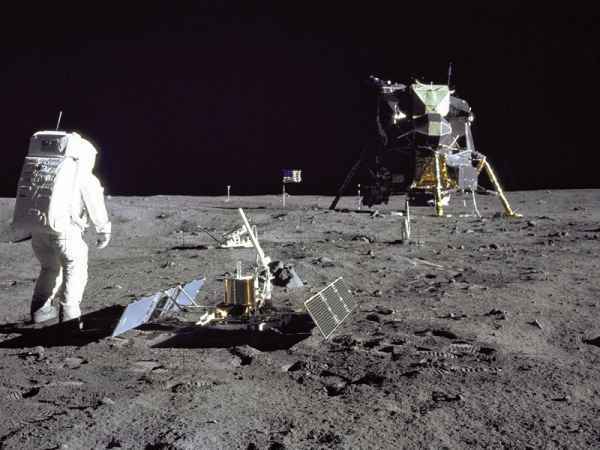 The moon landing was the culmination of a program begun a dozen years earlier after the Soviets launched Sputnik, the first man-made orbiting satellite. American public opinion was jolted at the thought of the Soviets in charge of outer space, but Eisenhower and most of his advisors were not so disturbed. Sherman Adams, for example, told a predominantly Republican audience that the so-called satellite race was just "an outer space basketball game." I believe that this flippant remark was wrong in substance and disastrous in terms of public opinion. The next night I told an audience in San Francisco, "We could make no greater mistake than to brush off this event as a scientific stunt of more significance to the man on the moon than on men on Earth." In cabinet and NSC meetings during this time I strongly advocated a sharp increase in our missile and space programs. Eisenhower finally came around to this view and approved a proposal; for manned space vehicles. While he justified this decision on military grounds, I felt that something far more basic was involved. I believe that when a great nation drops out of the race to explore the unknown, that nation ceases to be great. The manned space program was already well under way when President Kennedy captured the national imagination in 1961 by setting the goal of a moon landing by the end of the decade. 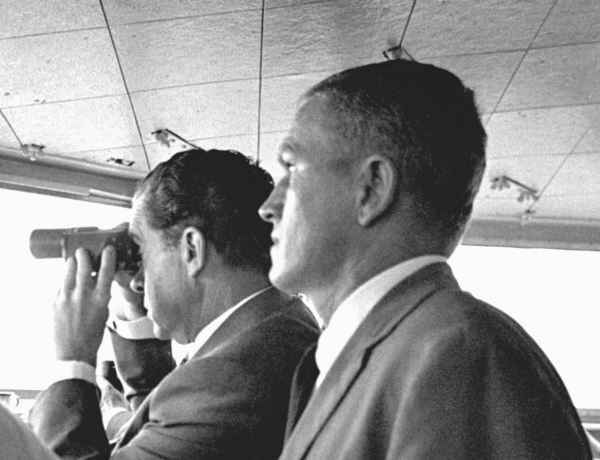 President Johnson was an enthusiastic supporter of NASA, and under his administration the Apollo program made great strides . . . .
On Sunday night, July 20, Apollo VIII astronaut Frank Borman, Bob Haldeman, and I stood around the TV set in the private office and watched Neal Armstrong step onto the moon. Then I went into the Oval Office next door where TV cameras had been set up for my split-screen phone call to the moon. Armstrong's voice came through loud and clear. I said: Because of what you have done the heavens have become a part of man's world. And as you talk to us from the Sea of Tranquility, it inspires us to redouble our efforts to bring peace and tranquillity to Earth.